The 1960s was one of the most significant decades in history. It included the civil rights movement, the Vietnam war, assassinations, riots, a drug culture, a sexual revolution and men going to the moon. John F. Kennedy. Richard Nixon. Contraceptives. Touch-tone telephones. Heart transplants. Trans-Atlantic satellite broadcasts. The first Super Bowl. 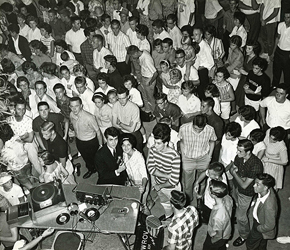 It all happened in the 1960s, which also happened to be the "heyday" of local Top 40 radio. As Jack Fisher recalls, "radio emerged out of the shadow of TV and forged its own identity in this decade by adopting and defining music and news formats that were designed to appeal to specific demographic audience groups. It not only had a willing and receptive audience, but a whole lot less competition for their attention. There were only three TV networks to watch, no Internet or video games. The DJ playing the hits and doing wild and crazy stunts was a real star in the local markets where he worked. ROVer the Bulldog in a February 1960 ad in "Sponsor" magazine. "Radio also was supporting the new and more independent lifestyle that the young were just starting to explore. It was portable and as mentioned, the rock format was directly talking to them, reflecting their desires and interests of the time." 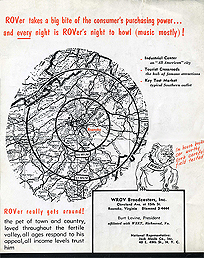 This certainly became the case in Roanoke, where WROV became such a dominant station that it could boast of having "more listeners than all other local radio stations combined." WROV entered the 1960s with a staff that included Jerry Joynes, Barbara Felton, Ken Tanner, Wynn Alby and Gary Cooper. 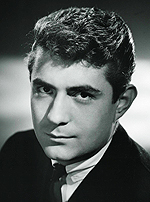 During 1960, Gary left for WRIS and was replaced on the all-night show by Leigh Jones. 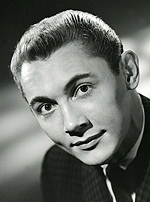 Ken Tanner departed the morning show and was replaced by Fred Covington, who simply went by "Freddy" on the air. Barbara left for a job in Richmond and her Woman's World hour was filled by the return of Jim Gearhart to the midday show. Wynn Alby also departed and his evening shift was filled by George Prescott, whose show was called Prescott Presents. Wynn Alby (on the far right with the trophy) poses with area high school "Most Popular" football players, Fall, 1960. 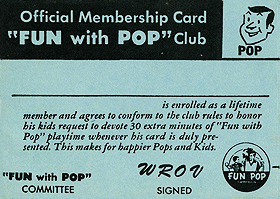 During the summer of 1960, WROV participated in a big national promotion called Fun with Pop. The purpose of this promotion was to encourage families to have fun together. Kids were asked to write, in twenty words or less, how they have "fun with pop" and mail this to the station. In return, they received pairs of membership cards—one for the kid and one for "Pop"—and were entered into a drawing. Local entrants could win all sorts of prizes including model airplanes and board games. Each local first prize winner was then entered in a national contest whose winner received a home swimming pool. The turnover of the staff continued into early 1961. By February, George Prescott had moved on and was replaced by Tim Lockhart. Jim Gearhart left for a brief stint at WHYE before heading to KQV in Pittsburgh, and was replaced on the midday show by Adam Hill. Leigh Jones departed from the overnight shift and was replaced by Don Hudson. 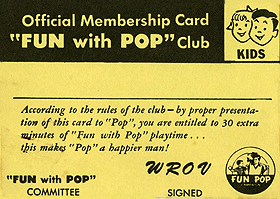 Fun with Pop membership cards were given to kids and fathers who entered the contest during Summer, 1961. Roanoke was experiencing above average unemployment in early 1961, made worse by post-holiday layoffs and inclement winter weather. Just as the United Fund and Salvation Army were exhausting their funds providing assistance, WROV came to the rescue. In February, the station issued a "call to aid" in the form of a 24-hour radiothon which raised $3,600 in cash, pledges of food, clothing, and employment. This also had the effect of raising awareness of the problem, which was later taken up by the City Council. The WROV of the late fifties through the mid-sixties was easily identifiable by its "chimes" format, which featured "Big Ben" chimes on the quarter hour along with voiceovers announcing the time. The chimes were taken from an electrical transcription record. Anyone near a radio in Roanoke back then can recall chimes and other drops which included the "WROV Housewife of the Hour." Women who listened during the day were encouraged to send in their names. Every hour, one was announced and she had fifteen minutes to phone the station to win a prize. 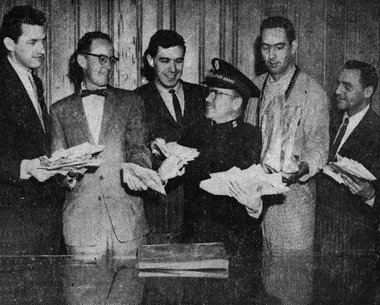 WROV Staff Members raised money for the unemployed in February, 1961. Pictured from left are Tim Lockhart, Chester Cooley of the United Fund, Adam Hill, Capt. Ken Johnson of the Salvation Army, Jerry Joynes, and Burt Levine. Public service announcements were read after a sounder announced a "WROV Call to Aid." New records, which members of the staff believed would become hits, were played following a drop announcing another "WROV Wax to Watch." Oldies were played after we were told we were going to the "Cobweb Corner." And daily horoscopes were read following an introduction of "the WROV Staroscope." Jerry Joynes remembers that the "chimes" gave the station consistency. "The personalities were still totally different. When you signed off and the next person came on, the show was different. We didn't really have a station sound until they got the bells." The "chimes" format was always called "the Jess Duboy Chimes." Jess was the Richmond radio announcer whose voice was heard along with the chimes. His wife, who was married to a former Miss Virginia, was recorded singing the call letters, a cappella, and became known as the "WROV Girl". For years, all of these recordings were on one reel of tape called "the format reel," in order, with about a second between each cut such that the disc jockey could play one, press "stop" and know that the next was queued up and ready to play. 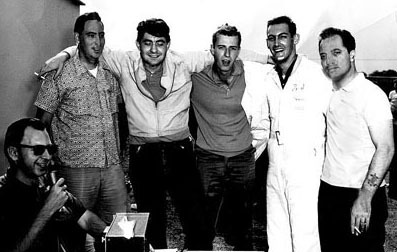 The WROV Crew, Fall, 1961: Dave Novak, Jerry Joynes, Ron Sunshine Fred Frelantz, Jack Morgan and kneeling in front, Bob Scott. Jack was strictly a salesman. All the rest were on the air. The chimes format was used through 1966 in its original form, then scaled back when WPXI "Pixie Radio" came on that summer with hot jingles that made the "chimes" sound dated. After Pixie's demise, the "chimes" briefly returned without the long top-of-the-hour cut (with one bell for each hour) and with some of the cuts re-recorded. Jess DuBoy went on to fame and fortune running a Richmond agency that specialized in advertising for car dealers and featured Jess standing in front of chroma-keyed pictures of various car lots while telling you to come on by for a great deal. Ron Sunshine, Dave Novak and Bob "The Wild Child" Scott, 1961. Years later Jess ran into Bob Lackey (Bob Dale on WPXI) who recalls "Several years ago, I had a chance to speak with Jess DuBoy. He was in North Carolina doing a commercial for a new car dealership and I told him that the old WROV format that I heard for years growing up in Roanoke sounded as if "two" people were on it. He confirmed that this was the case and the other man was Bob DePugh. "DuBoy said DePugh had become a dentist in Florida. DuBoy gave me the name of the town and I called and sure enough a dentist by that name was still in practice. I got the number from information and called his office and they put Dr. DePugh on the phone. And he DID confirm he did the WROV "chimes" format with Jess DuBoy and he is the one that does the WROV weather watch, the Wax to Watch and the Cobweb corner. Jess DuBoy did say that about 1966 he re-cut much of the "chimes" format to make it fresh, but the DePugh cobweb corner intro remained on the air. Jess then said by 1968, Burt had put most of the old stuff back on the air." 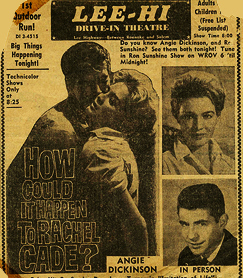 Ron Sunshine and Angie Dickinson made an appearance at the Lee-Hi Drive-In Theater in 1961. Most Roanokers did not know that during this era, Burt Levine owned another radio station. He purchased WEET "1320 Fun Radio" in Richmond, VA in 1959 and owned it until 1967 when he sold it to another Roanoke radio man and former WROV personality, Ray Bentley. For a while, WEET was programmed by Jess DuBoy and we assume that this arrangement led to Jess' voice being the one used for most of the "chimes" format. WEET's announcers included Gene Werley and Big John Belt and a few who eventually made it to WROV in the 1960s, including Buddy O'Shea and H. Gale Henley. And the manager of WEET was Don Foutz, who became the General Manager of WROV in the late 1960s. WEET called their weekly playlist "The Thirteen and Twenty Survey" and it was broken down into the "Top Thirteen" songs followed by twenty more called "The Roaring Twenty." And like sister station WROV, the surveys included "Wax To Watch" records and "Winners Picks." 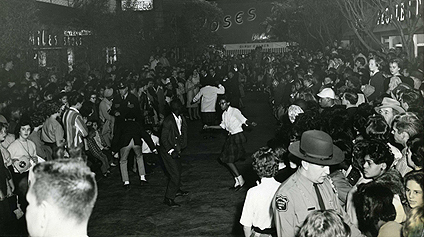 Ron does a record hop at Crossroads Mall, 1961. 1961 saw the arrival of the man who would work at WROV longer than anyone else in the station's history, Jim Carroll. 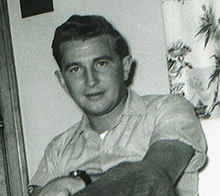 Jim, an Iowa native, worked for Armed Forces Radio while in the Army in Korea. He later did the all-night show for KOOL in Phoenix, then worked in Rome, NY. Jim came to WROV to do sales and occasional work as an air personality. A couple of years later he became the sports director. Jim recalls that he adopted his radio persona once he got to Roanoke. "When I came down here from Rome I was going a lot of DJ work. I was also doing sales and the boss down here (Burt) didn't really want me to use the same name for both so he said 'Why don't you change your name on the air? Go with something you're comfortable with.'" So Carroll James Colston became Jim Carroll on the air while remaining Jim Colston in the front office. He would stay with the station in one or both roles for the next 41 years. Also in 1961, Freddy Covington left and Burt saw this as a chance to make the station sound "big" by bringing in someone from a big city, a great entertainer with lots of show business connections. So he hired a guy named Ron Sunshine from New York City. WROV Record Hop at Crossroads Mall. They expected about 500 people. Thousands showed up. 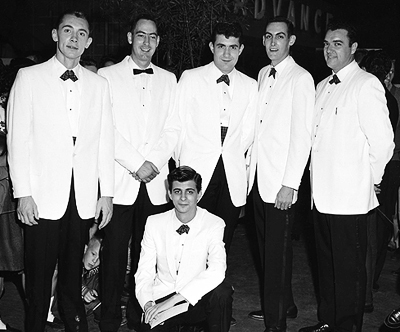 Ron had done record hops and knew many show business people including Freddy Cannon and Del Shannon. He studied broadcasting at the University of Oklahoma and worked part-time at KOMA in Oklahoma City until leaving school because of illness. After recovery he decided to pursue a job as a disc jockey and applied to many radio stations including WROV, where Burt was impressed by his skills and his "big name" friends. According to Ron, Burt wanted "personality AND show business" and wanted him to play the records and "talk about Freddy and Del and the others and make it personal." So Ron came to WROV and became immensely popular. He was the first local radio personality since Jivin' Jackson to do record hops and worked out a deal with the local Coca-Cola bottler to sponsor them. Most were held at Crossroads Mall because it was the only indoor space they could find that was big enough for crowds which exceeded 8,000 people. 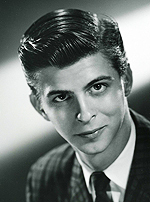 Ron could also be heard on the Saturday morning WROV show "Teen Town" which featured two kids from each local high school who rated records and featured appearances by nationally known stars such as Bob Denver, Burt Ward and Neil Sedaka. And his usual co-host for the show was Adam Hill. 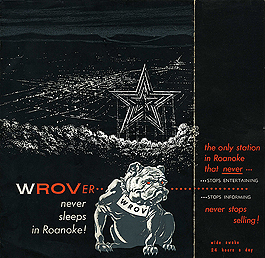 The Early 1960s WROV Sales Brochure featured ROVer the Bulldog. Front (top left), Back (top right), and Inside (bottom). Adam was another WROV personality with big show biz connections. Originally from Culpepper, VA, Adam migrated to Hollywood after a few years studying drama at Duke University and ended up doing publicity for KTLA-TV while doing some acting on the side. He was signed to a contract by Adeline Fidler whose husband Jimmie did the show "Hollywood Report." This led to Adam appearing in several TV shows including Dragnet, and several films including "Penny Candy." After a stint in the Navy, he worked as a model in New York before his stint at WROV. During the summer of 1961, Tim Lockart left for a job in Louisville and WROV needed to find someone talented and witty enough to replace him on the morning show. When Burt asked Ron if he knew of anyone who fit the bill, he immediately suggested his former college roommate from Oklahoma, Frederick David Wilson Mugler III. 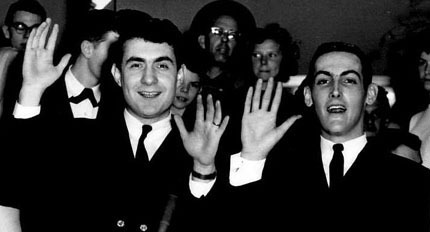 Ron and Fred had attended the University of Oklahoma together where they ran the school radio station. Fred was born and raised in Lake Charles, LA and worked as a disc jockey while in high school. During college, he worked at KOCY in Oklahoma City then KIRL, Wichita, where he came up with the name Fred Frelantz (a comment on the wandering nature of rock and roll disc jockeys) but management wouldn't let him use it. So he went by the name "Derf O'Day" (O'Day was the last name of another well-known local personality and Derf was "Fred" spelled backwards). Upon arriving at WROV, Fred was an instant hit. In addition to being a great disc jockey, Fred was a comic genius, spontaneity was one of his great virtues. He never prepared anything before he went on the air, he just talked about whatever came to him and could ad-lib better than anyone who has ever lived. Fred and Ron roomed together in an apartment Grandin Road, then one on 1st Street at Elm with a third guy who was the manager of Sears. 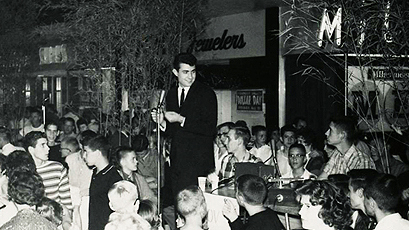 Ron Sunshine & Fred Frelantz during an appearance at Crossroads Mall, 1962. On WROV, Fred originally called himself "Dr. Fred Frelantz" and said he was broadcasting from the "Feltbetter Clinic." He had a high-pitched female character (Fred, using a high falsetto voice) called "Gertie". Other times, Fred would put piano bar music in the background and say he was broadcasting live from the C. Moore Broads Auditorium. Fred announced a "Disease of the Day", a made-up illness for listeners to use when calling in "sick" to work (one was "detnitisflopdoodus" which was "cross-eyed knee caps"). He was a genius of self-promotion and often had himself paged in restaurants to increase his name recognition. He was also a prankster and did such things as drive around town talking into a light blue Princess-phone receiver attached to a cord, pretending to be talking to someone just to get people's attention. 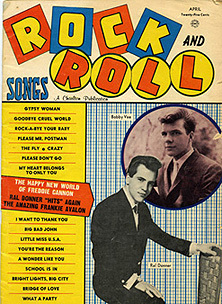 The April 1962 Rock & Roll Songs magazine made Fred & Ron famous across the US & Canada. Ron, Fred and Jerry were constantly playing jokes on each other. Jerry remembers one that he pulled on Ron: "There was a production room and the studio and they faced each other. Everything—and Al Beckley was great for that—was remoted. You could do everything in one room that you could do in the other room. I could start a tape machine in the production room from my machine in the control room. And everything came up on patch boards. And we'd have great fun making TT 1 come up on TT2 and TT2 come up on TT3 and those kinds of things. "And we'd do this to each other and laugh and laugh and laugh. I got Sunshine one time, I never will forget. He was trying to cut something in the production room. They used these big huge Gates tape machines to dub commercials onto carts. And every time he'd start it I'd have my hand on the stop button and stop it. And he did it again and again. And I was just sitting in the control room looking like I was reading the newspaper. And he'd stop and look all confused, then I'd start it again. I'm sure he had to have figured it out, but he couldn't that day." Another shot of Ron at a Crossroads record hop. Did this many kids live in Roanoke in 1962? Ron and Jerry were also participants in a series of weekly all-night poker games with Policeman Alvin Hudson and show promoter Pete Apostolou. Jerry recalls "Al Hudson...he became a captain, then he became a councilman. He was a motorcycle policeman. And I hung out at the record store, which DJs at that time tended to do, the Globe Record Shop downtown. And Al was downtown a lot. He walked a beat downtown then he got a motorcycle later. Then he became a lieutenant. But we had started the games when he was a policeman. "Al also worked at Toots Drive In on Williamson Road. Cruising Williamson Road was a big thing at that time and Toots was a big thing too. And you could drink on the curb and stuff. Anyway, Alvin was the officer, he was there, he did it on his private time. Anyway I got to know him that way. And Pete Apostolou. I also did ring announcing for wrestling. And he did that. And we were going to do a promotion together for the downtown parking garage. We had it all figured out, the dance equipment we'd need, all the stuff we had to do. We had it pretty well set and ran into some trouble with the insurance, with the amount we'd have to have. People jumping off of there wouldn't be very good." 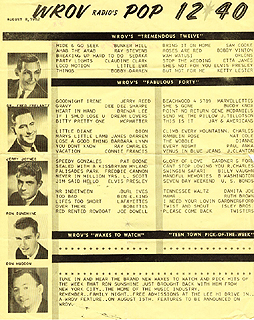 The WROV Pop 1240 chart from August 8, 1962. By the end of 1961 the WROV staff consisted of Jerry, Ron, Fred, Dave Novak, Bob Scott who called himself "The Wild Child" and Jack Morgan. Ron recalls "Morgan went to school with Fred and me. After I got Fred the job, Burt asked if I knew anyone with sales experience. So I told him about Jack. Jack interviewed with Burt and got the job. He moved in with Fred and me into our first apartment on Grandin road. Jack was about 6 or 7 years older than us. He was in the military and went to school on the GI bill. Jack was slick, kind of like the proverbial salesman that could sell ice to an Eskimo." Another well-known person of the era was part time disc jockey and engineer, Richard "Mopey" Williams. A graduate of Jefferson High, "Mopey" was studying law at Houston University but worked at WROV while home on breaks from school. He is perhaps best remembered for spending nine days living inside of a 12-foot-long cylindrical fallout shelter that had been set up for display at the newly opened Towers Shopping Center, at the height of the Cold War "bomb shelter" craze. Mopey Williams emerges from a nine-day stay in a bomb shelter at Towers Shopping Center in November, 1961. During his stay in the shelter, Mopey lived on canned food, Army "C" rations and distilled water. He slept on a small mattress on a shelf, washed in a rubber basin, and when "Mother Nature" called, used a small chemical toilet. 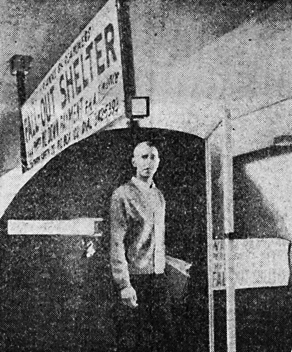 The shelter was equipped with a telephone and for five minutes out of each hour, he called the station and was put on the air to relay his experiences. He said the thing he missed most while in the shelter were green vegetables. But, overall, his stay wasn't much of a discomfort and if need be, he'd do it again. 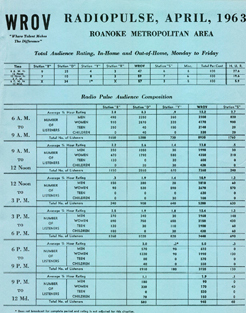 WROV's ratings during the early 1960s were incredible. The station routinely attracted well over fifty percent of the audience. Jerry Joynes, who did both the morning and afternoon shows, remembers "Oh yeah, yeah, I did two shows on there. 9-12am and 3-6pm. The funny part about it was, I knew nighttime was going to decline because TV was really getting strong in the early 1960s. But what I didn't realize was what a solid audience you had at 9 o'clock in the morning because work people listened at work, and home people listened at home, and they didn't cut it off. 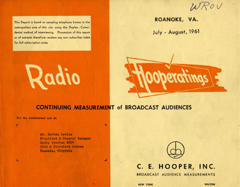 The 1961 Hooper Ratings showed WROV was the dominant station in Roanoke. "So I had this thing running with Fred after he came, he never could beat my ratings, but that was the reason. Morning was in transit, but I came along and had his audience then got to build on it. Fred was solid but he never got a 55 share." 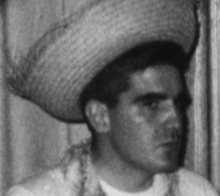 Another WROV personality of the early 1960s was Don Pugh. Don was from Bedford and had worked at WBLT with Jack Shields. Don worked the all-night show on weekends and this led to him meeting his wife. Don's son Steve tells us "Mom worked at Globe Records for 25 years (late 50's to early 80's). She had a lot of ties to the local radio industry herself. In fact, she met my Dad through WROV!! Fred Frelantz, Freddy "Boom Boom" Cannon and Ron Sunshine, 1962. "He worked the late night shift on the weekends and Mom and some friends of hers from work had a slumber party at Globe Records in downtown Roanoke (they actually spent the night). They called in to the radio station to request a song and ended up talking to my Dad, who was DJing that night. When his shift was over in the morning, he stopped by Globe Records and took my Mom and her friends out to breakfast. The rest is history!! They were married six months later." Jack Shields remembers that Don always used to pronounce the word "arab" with an emphasis on the first syllable ("AYY-rab") instead of the correct pronunciation when he was reading the news, etc. So they sat down with him and said "Don, you need to say 'arab' instead of 'AYY-rabb' because if there are any local listeners of Middle Eastern descent they may be offended." So he started saying "arab" instead of "AYY-rab." 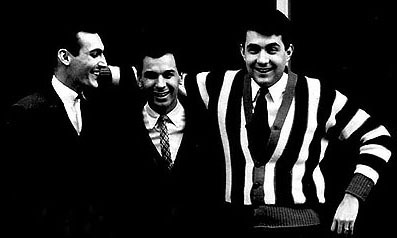 George Dyer and Don Pugh were both heard on the overnight show during the early 1960s. Well, about two weeks later, Ray Stevens released his song Ahab the Arab (and if you've ever heard that one, Ray pronounced it "AYY-rabb" so it would rhyme with "Ahab"). So Don went on the air and said "Now, here's Ray Stevens with 'Ahab the Arab'. So then they had to go back and say "No Don, this time you pronounce it 'AYY-rabb' instead of 'arab'." Eventually he got it right. Don later worked in sales at WROV, WFIR, WSLS and WBLU. In the spring of 1962, WROV was given permission by the FCC to raise its daytime power from 250 to 1000 watts. This change was approved for all 1240 stations in the United States and allowed WROV to cover a larger area with a better signal during the daytime hours and this added to their dominance of the local radio market. About that same time, Jimmy Witter left and was replaced on the night show by Don "Hudson" Hutcherson, who called his program "The Hudson Hassle." 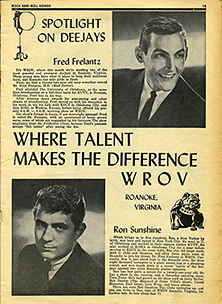 In September, 1962, WROV hired Bernie Mann of New York to be manager of WROV. Bernie, 27 at the time, had been sales manager of WTRY in Troy, NY and also put in time at WAKE, Atlanta and WEAV, Plattsburgh, NY. Burt, at the time, was also owner of WEET, Richmond and had just sent WROV salesman J. P. Morgan to become the station manager of WEET. This created an opening for a manger of WROV which was filled by Bernie. Bernie's real name was Bernie Mandel but he changed his last name to "Mann" to follow the current craze of radio announcers coming up with slick-sounding air names. 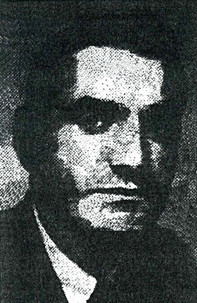 Bernie Mann became GM in 1962. A few months after Bernie came on board, Jan Wilkins joined WROV as director of creative services. A native Roanoker, Jan was a graduate of Jefferson High School and had studied theater and drama in college. He came to WROV from crosstown rival WHYE "Y" Radio where he'd been the production manager and the announcer of the midday show called "Downbeat." 1963 saw WROV continue its ratings dominence though they lost the man who, more than anyone prior, had helped establish their image as the Star City's youthful rock and roll station. Feeling he'd done all he could do at WROV, Ron Sunshine left that summer for Dallas, then went back to New York where he became an agent specializing in rock & roll. Along with his colleagues, Ron represented many of the British Invasion bands including Herman's Hermits, The Who, The Animals, The Hollies, and Led Zeppelin; as well as American acts such as Mitch Ryder, Freddy Cannon, Little Anthony and Blood, Sweat & Tears. In the mid-1970s, Ron became a show promoter. Meanwhile, back at WROV, new arrivals that year included Jack Shields, Jim Reese, Glenn C. Lewis "The Voice of The Turtle" and a new Gates Diplomat control board. RCA cart machines were also added, making it easier to run commercials, the chimes, and to drop "The Girl" in between songs, over song intros, anywhere she would fit. Why was WROV so popular? There were many reasons. For one thing, geography played a role. There was no competition from out of town. The nearest "big" city is Greensboro which is about 100 miles away, and because of the nature of the Roanoke Valley—Piedmont Airlines pilots used to say landing in Roanoke was like trying to land an airplane in a big cereal bowl—most distant radio signals weren't able to penetrate the market. 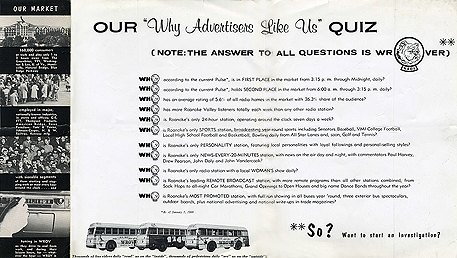 The 1963 Radio Pulse survey showed that WROV DID have more listeners than all other stations combined! Another reason was weak, non-focused local competition. Throughout the sixties and seventies, a few local radio stations including WSLS, WHYE, WRIS, WBLU and WPXI briefly offered credible competition but for the most part others that tried offering the "Top 40" format paled by comparison. FM radio had yet to come into its own, especially in Roanoke where until well into the seventies it was little more than a vast wasteland which featured classical and elevator music. Also, most automobile and portable radios of the era weren't equipped to receive the FM band. That, combined with the evolution of rock and roll music, the baby boomer phenomenon, the engineering expertise of Al Beckley, and WROV's line-up of top-notch radio personalities made it sound better than any other station on the dial and the ratings proved that the listeners could tell. And it was about to get better. The following year, America would meet a British band called "The Beatles" and Roanoke would meet a personality named Jack Fisher.